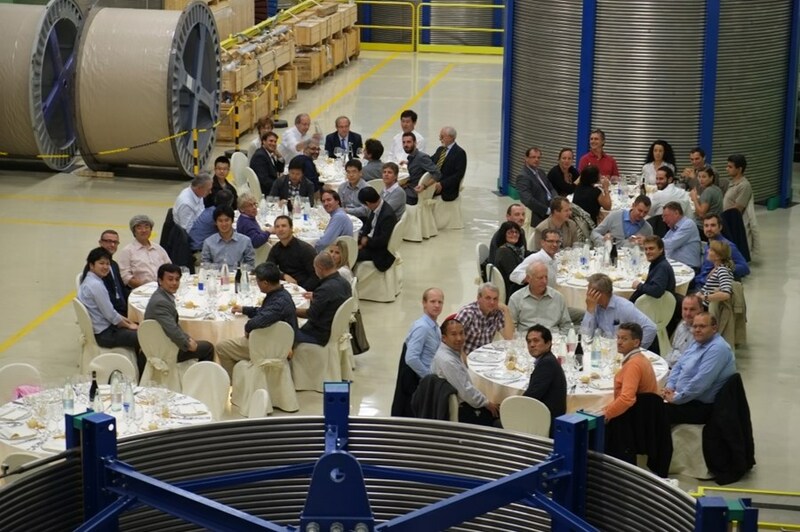 Dining among spools of coiled conductor at Criotec (Turin, Italy) could only be good for the morale of the 50+ participants at the latest Conductor Meeting. Five years ago when the very first Conductor Meeting convened at ITER, only a handful of magnet Procurement Arrangements had been signed and strand production had not yet been launched in the factories of China, Europe, Japan, Korea, Russia and the US. This past week, the tenth Conductor Meeting took place in Turin, Italy near the Criotec facility—where production lengths of toroidal field conductor have been coming off the jacketing and compaction lines since 2012 and, this year, the first poloidal field copper dummy was jacketed for Russia. 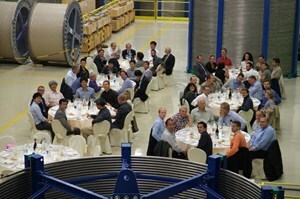 Conductor Meetings, held semi-annually, bring together members of the magnet teams from ITER and the Domestic Agencies, ITER Organization contractors, and industrial suppliers from the six producing ITER Domestic Agencies for a review of the status of magnet qualification activities, strand production, cabling, and jacketing. Welcoming over 50 participants was Antonio della Corte, from the ICAS consortium (ENEA, Tratos Cavi, Criotec). "The meeting is an excellent opportunity for the main actors involved in ITER conductor and coil fabrication to share their know-how and to develop common technological expertise," says Arnaud Devred, head of ITER's Superconductor Systems & Auxiliaries Section. "In a collegial setting, open issues can be discussed in a thorough and constructive way." 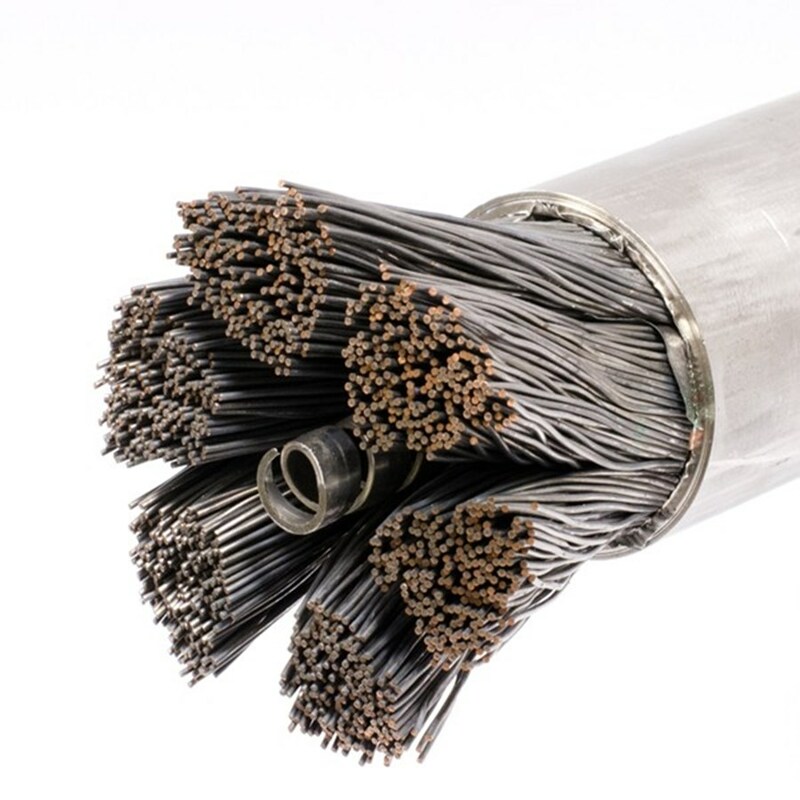 Approximately 95% of ITER toroidal field strand lengths and more than half of toroidal field conductor unit lengths have been fabricated in China, Europe, Japan, Korea, Russia and the US. Image courtesy of Florida State University. As ITER conductor production reaches its peak, the focus of magnet activities is shifting to the next phase—coil manufacture. In Turin, in addition to the responsible officers from all 11 conductor Procurement Arrangements, representatives for the coil Procurement Arrangements were present to discuss interface issues (responsible officers from Europe and Japan for the toroidal field coils, from Europe and Russia for the poloidal field coils, from China for the correction coils, and from the US for the central solenoid). Arnaud reported during the meeting on the continued strong progress in conductor production. Approximately 95 percent of toroidal field strand lengths and more than half of toroidal field conductor unit lengths have been fabricated. Strand and conductor production for the poloidal field coils has been launched in Russia, Europe and China. Correction coil and feeder (correction busbar) conductors have entered production in China. And, last but not least, a technical solution has been found for the challenging central solenoid conductors and production has been launched for the lower module of the central solenoid coil stack module (CS3L). "In spite of a difficult environment and tough constraints, thanks to a generalized collaborative spirit, mutual trust and understanding at the technical level we are making great strides in ITER conductor production." The next Conductor Meeting will take place on 18-20 March 2014 at the ITER Organization.